For professional, effective carpet cleaning, Irving residents trust KIWI to get the job done right. Our customers quickly become KIWI Lovers once they discover our affordable, friendly services. When you schedule a visit from our Irving team, you can expect professional, expert service from our knowledgeable technicians. They can identify fibers, solve tricky stain challenges and apply our unique dry cleaning method. We’ll tailor our services to your cleaning needs and carpet type to ensure you get the results you want. Most other carpet cleaning companies in Irving offer steam cleaning services. However, KIWI offers a green cleaning method that produces no waste water and cleans just as effectively. KIWI’s Irving team uses an eco-friendly method with a hypo-allergenic, pH-balanced cleaning solution. We use a gentle yet effective bonnet cleaning process to wick up every last bit of dirt and grime from your carpet fibers. It’s a mostly dry process, which means your floors will be ready to walk on in as little as 15 minutes after we complete our cleaning. And best of all, our cleaning method is all-natural and safe for your children and pets, even with frequent application. KIWI’s carpet cleaning services offer the best cleaning process for your home. Our cleaning solution is able to get rid of all dirt and grime, pet odors, and really get down deep in the carpet fibers. Our carpet cleaners are the best in professional carpet cleaning and we have a quick drying time because we use dry cleaning over hot water extraction. You will have your carpets dry in as little as 15 minutes while also having the cleanest carpets in the neighborhood when you choose KIWI. We also offer air duct cleaning, tile and grout cleaning, as well as commercial cleaning for your business in the Irving and Fort Worth area. Our customer service is also the best in the industry with representatives eager and ready to answer any inquiry you have as well as offering a 30-day clean guarantee on all of our services. 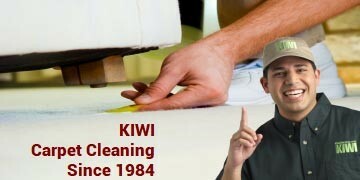 After your initial visit, our customers get a 100% Clean Carpet Guarantee from KIWI to ensure they like their results. In addition, you’ll get our One-Year KIWI Lover Carpet Cleaning Warranty, which provides you with unlimited $4 per room cleaning, plus a small trip charge, for a full year after your initial visit. For the best in service, results and value, call KIWI’s Irving team today!